I was reading this morning about July 4th and found that there are lots of literary convergences on this day – many of them related to some of my favorite writers. 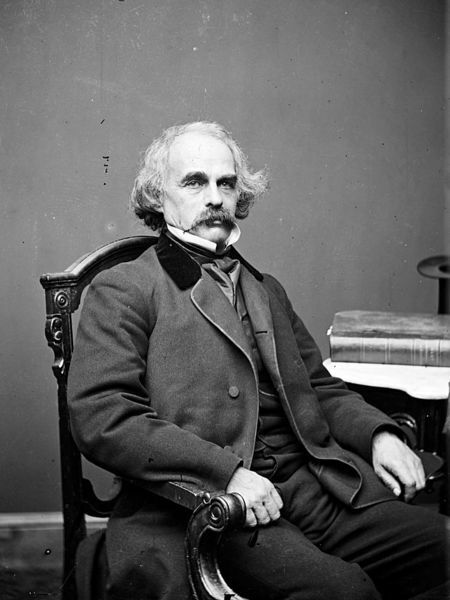 For example – did you know that today is Nathaniel Hawthorne’s birthday? Yup. 1804 was the year and Salem, Massachusetts was the place (an appropriate natal spot for this talented, reclusive, and darkly haunted individual). I also found that Hawthorne had a significant NH connection, not only in the White Mountains (which figure a lot in his tales) but also on the Isles of Shoals – which he visited in 1852 and chronicled in his journal. July 4 ,1845 found Henry David Thoreau packing up and moving out to his newly-built cabin on Walden Pond, outside of Concord, Massachusetts. Most likely, Hawthorne would have crossed paths with Thoreau (if/when he left his house), as he was still living at The Old Manse in Concord in 1845. Indeed, describing Thoreau, Mr. Hawthorne wrote: “[Thoreau] is as ugly as sin, long-nosed, queer-mouthed, and with uncouth and rustic, though courteous manners, corresponding very well with such an exterior. But his ugliness is of an honest and agreeable fashion, and becomes him much better than beauty.” Then in 1854, July 4 saw Thoreau speaking out against slavery at the annual meeting of the Massachusetts Anti-Slavery Society. Ten years after Thoreau moved to Walden (and a year after the 1854 publication of his masterpiece about that experience) Walt Whitman published, on July 4th, 1855, the first edition of his seminal work, Leaves of Grass. This tome appeared in many editions over Whitman’s lifetime, with the first including 12 poems and the last (the “Deathbed Edition“) including more than 300 poems. The Good Gray Poet published this first edition himself with a friend and it caused quite a stir. Here’s a link to the 2005 NPR story, marking the 150th anniversary of this literary event! This entry was posted in Random Thoughts and tagged Concord, concord massachusetts, henry david thoreau, isles of shoals, july 4 1845, leaves of grass, Massachusetts, Mr. Hawthorne, nathaniel hawthorne, old manse, salem massachusetts, Walden, walden pond, walt whitman, white mountains. Bookmark the permalink. Wow, Alice – this is awesome! I agree that Whitman would say the same or worse about the current occupant of the White House … and am whole-heartedly with you in your wish for peace. And I have a question … would you ever consider being a guest blogger here? Ouch! I don’t think Walt visited New Hampshire, but he was the truest kind of patriot, and I expect he would share similarly choice sentiments about our present president who, to my mind, has easily overtaken Franklin Pierce’s spot at the bottom of the list of America’s most wanting. Happy 4th. May it help to (somehow)converge with peace.